Holding over 12,000 fiction and non-fiction titles, 10 computers and numerous magazines, DVDS and audio books, Cams Hill School Library is a well-stocked, vibrant and modern learning resource centre. We open at 7:50am, enabling pupils to read, exchange books, complete and print homework, conduct research, use the colour copier and make use of our games trolley which holds chess, Cluedo, Battleships, card games and many more. We are also available to pupils during breaks in the school day and for 15 minutes after school. Pupils will be taught in the Library regularly by subject teachers making use of the interactive whiteboard, recently installed computers and wide-ranging non-fiction stock. Keen readers will have the opportunity through the Library to participate in book groups, the Hampshire Book Award and also the Hampshire Literature Quiz, which we are proud to have won in the past, travelling to Winchester Discovery Centre for the final. 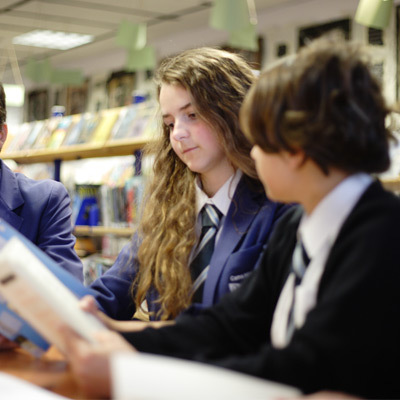 Pupils are required to have a reading book at all times in order to take part in our Drop Everything And Read initiative, which takes place every afternoon for ten minutes, during tutor time. Please click on the links to find recommended reading lists and photographs of some of our activities.